HAN Automotive consists of HAN Automotive Research; the departments of I-Mobility & E-Mobility, the research lab - ARL-A (Applied Research Laboratory - Automotive) and the courses that HAN offers in the field of automotive. Researchers, lecturers and students are available to you in various ways to tackle a research question or a project. Feel free to contact anyone of us, we are happy to discuss with you about how HAN Automotive Research can contribute to the developments in your company. 1. Research carried out by our PROFESSIONALS - Research staff and specialized lecturers, under the direction of their own project manager, work together to quickly achieve a professional result. Our professionals critically analyze a research question or a project and can call in (external) specialists from our partner network if that contributes to achieving a higher quality result. 2. Research carried out by a project group of STUDENTS: in this form, a working group of (4 to 8) students spend 10 to 15 hours per week on their research questions during their minor in one of the educational courses they follow. The student group is always accompanied by a "tutor". On request, agreements can be made about extra supervision by an expert or external partner companies. It is even possible as a "Client" to be directly involved in the supervision of the project group. If students are chosen for deployment, the result of the assignment is always limited to the best effort obligation. 3. 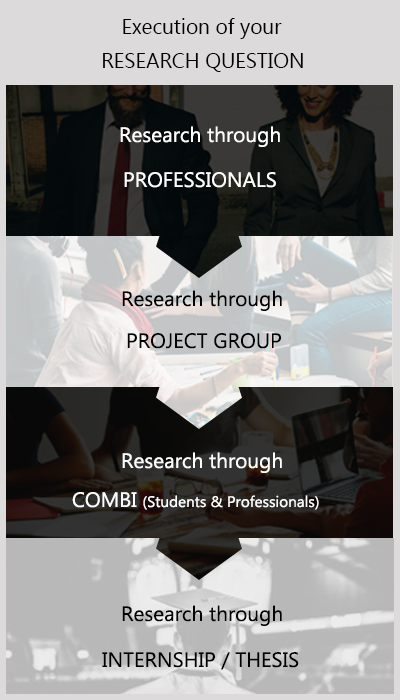 Research carried out by combination of STUDENTS / PROFESSIONALS: This option is often preferred because it benefits the students as well as the clients of the research assignment. 4. Research in the form of an INTERNSHIP/GRADUATION ASSIGNMENT: In this form, the client himself is responsible for supervising the student. The result is strongly determined by specific student and the circumstances in the company or organization where the student works.